Mark Zuckerberg and his data-hoarding creation Facebook remain in the crosshairs this week as scrutiny over its Cambridge Analytica profile-scraping scandal continues to mount, with the social media giant’s stock price falling by over 13 percent this week. So it’s not surprising that some of his fellow tech moguls are taking Zuckerberg’s moment of vulnerability to take some potshots. Tesla and SpaceX CEO Elon Musk very publicly deleted his companies’ Facebook accounts this week, though it’s unclear whether the move will be permanent. (Might have something to do with bad blood over that satellite of Zuckerberg’s he accidentally blew up.) Now Apple CEO Tim Cook, whose brand has long positioned itself as privacy-conscious, is publicly calling for Facebook to be regulated. Cook has more than a small point here—the amount of data Facebook has compiled on its users is best described as Orwellian. Everything that makes the site useful essentially exists as a pretext to keep users offering up more and more of their personal information to Facebook, which currently controls somewhere around one out of every five digital ad dollars spent in the country. A few months ago it was even testing a seemingly innocent “Did You Know” plugin in what seemed to be a test of how much further the company could cloak asking potentially revealing questions as a fun little game. There’s open speculation as to whether Cambridge Analytica is really the only company to abscond with huge amounts of Facebook user data or whether it’s merely the tip of the iceberg. In a recent CNN interview, even Zuckerberg admitted that perhaps the company should face some regulation, though he was careful to offer only minor concessions like transparency for political ads. But Cook appears to be calling for something more dramatic like stringent transparency and proactive user consent requirements, even though as a member of the ultra-wealthy set the chances of him calling for something like treating Facebook like a public utility or antitrust proceedings are probably nil. 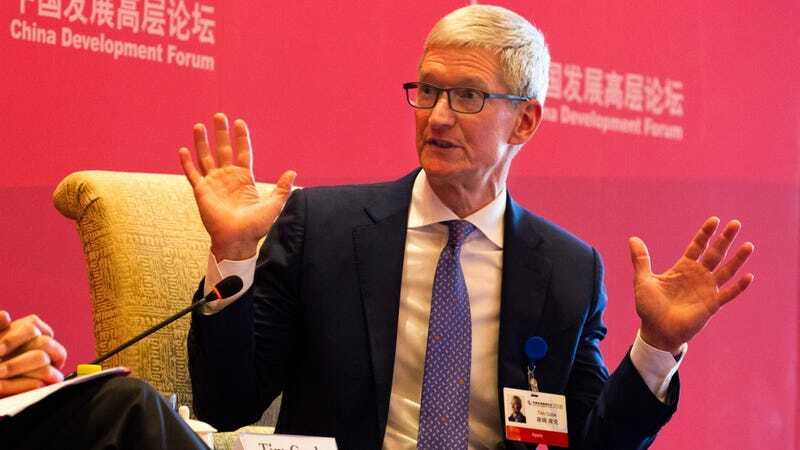 Cook’s words might also come off as a little insincere given Apple’s willingness to play by the rules of Chinese censors, though the company claims to not really have a choice between complying or losing its market access there.